A reverse chronological list of project updates is provided below. For latest project announcements, click here. On Monday, January 22nd, a Community Open House was held at the Copernicus Center in Jefferson Park to review and comment on draft recommendations for the Jefferson Park Station Area Master Plan. This was the third community meeting, and the fifteenth outreach meeting of the project which kicked-off in May of 2017. Approximately 75 residents, businesses and organizations attended the meeting that featured recommendations around transportation, economic development and community character. Detailed design guidelines and concept plans were also shown, allowing attendees to comment on each proposed idea and suggest possible partners for implementation. Key ideas presented that gathered positive comments included the idea for a winter garden to be home to restaurants and a year-round open space, providing a new drop-off /pick-up area for the Jefferson Park Transit Center, and improved signage and wayfinding to welcome visitors to Jeff Park. The materials that were presented at the meeting are all available here. Please send in your comments on the draft recommendations by February 12th to be incorporated into the draft plan by clicking here. Over eighty residents, 42 comment cards, and 983 dot votes for goals and projects. The second community meeting–held on October 16th at the Copernicus Center Annex–provided an opportunity for residents and local organizations to weigh in on the future of the Jefferson Park Station Area. Issues of community character, transportation and economic development were presented and discussed around image boards spread throughout the Copernicus Center Annex and Lobby. Ideas ranged from improving building facades to creating more open space for residents. Attracting businesses to Jeff Park was a major topic. Participants suggested creating a marketing campaign that local businesses could promote, and people discussed ideas to try and attract more entertainment to the area. Community character was also a major topic and focused on ways to promote development that builds upon the strengths of the area and offers places people would want to spend their time with their families. One transportation issue that received attention was about pursuing shared parking that could be used for events, stores and commuters. The meeting started with opening remarks from Alderman John Arena who welcomed everyone to the second community meeting, encouraged participation in the evening’s interactive activities and highlighted the importance of working as a community to take advantage of the area’s strengths to create a more walkable destination area with restaurants, businesses and places to spend time. Laura Wilkison reviewed outreach activities over the past summer – from the first Community Meeting on June 19 to Jeff Park Master Plan booths at Jeff Fest and the Farmers Market, as well as attending local meetings to solicit input. She also presented the results of 967 people who had taken the survey – showing that 84% of respondents ranked transit access as being good or excellent, 67% of respondents indicating that pedestrian crossings are a high priority, and about half of respondents go out to eat and shop in Jeff Park each week. 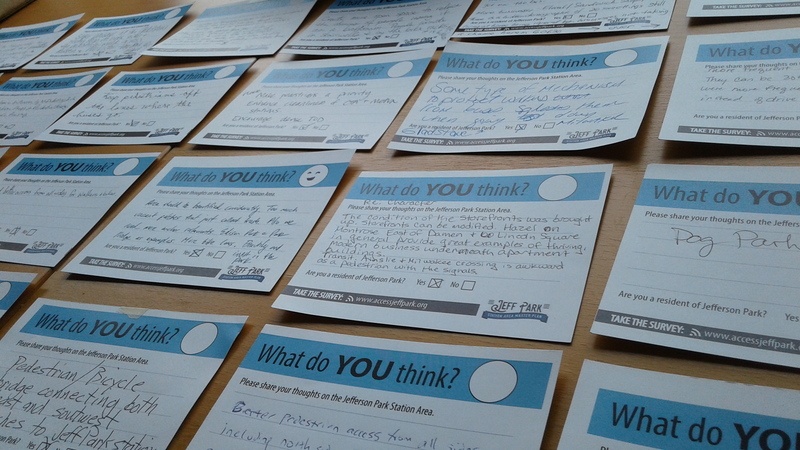 There was also an opportunity for people to lay out their vision for the future at three interactive map areas. Two of the stations focused on what types of uses made sense on the vacant land between Milwaukee Avenue, Lawrence Avenue and Lipps. The third area focused on making the street network safer where Foster Avenue crosses Northwest Highway, Milwaukee Avenue and Gettysburg Street. The next step for the process will be to compile all of the information gathered through the outreach efforts and begin to layout specific recommendations and project ideas. If you have additional thoughts and ideas, please submit them through the web site here. In early 2018, the draft recommendations and projects will be presented back for public comment at the third Community Meeting. The results are in. In total, 969 people answered questions about what they want to see for future improvements of the Jefferson Park Station Area. 70% of respondents live in the neighborhood, while most others are residents of the neighboring communities of Norwood Park, Forest Glen, Edgebrook, or Mayfair. 84% of respondents rate transit access as either good or excellent. Local shopping (77%), restaurants (70%), and walkability (49%) are the top elements rated as needing improvement. Almost half (48%) of respondents report that they shop in Jefferson Park at least once per week. 58% of people also shop in Niles at least once per week, and other popular areas include: Harlem Irving Plaza, Edison Park/Norwood Park, Six Corners, Lincoln Square, Harwood Heights, and Park Ridge. The most common place for respondents to dine is Jefferson Park, with 43% reporting that they go to a neighborhood restaurant at least once per week. Other dining destinations include: Niles, Edison Park/Norwood Park, Portage Park, Rosemont, Lincoln Square, Lincoln Park, Park Ridge, and Downtown. 67% of respondents say that pedestrian crossings are a high priority for future improvements in the station area. Other high priorities are improvements to staircases and viaducts (62%), greater walkability (46%), and more landscaping and greenery (39%). Thank you to all who took the time to fill out the survey! Your responses will help to inform the remainder of the planning process and will help shape recommendations for the Master Plan. Please continue to submit comments through the Share Your Idea feature at www.accessjeffpark.org. These were some of the ideas that came out at the first Community Meeting for the Jefferson Park Station Area Master Plan, which was held on Monday, June 19, at the Copernicus Center. 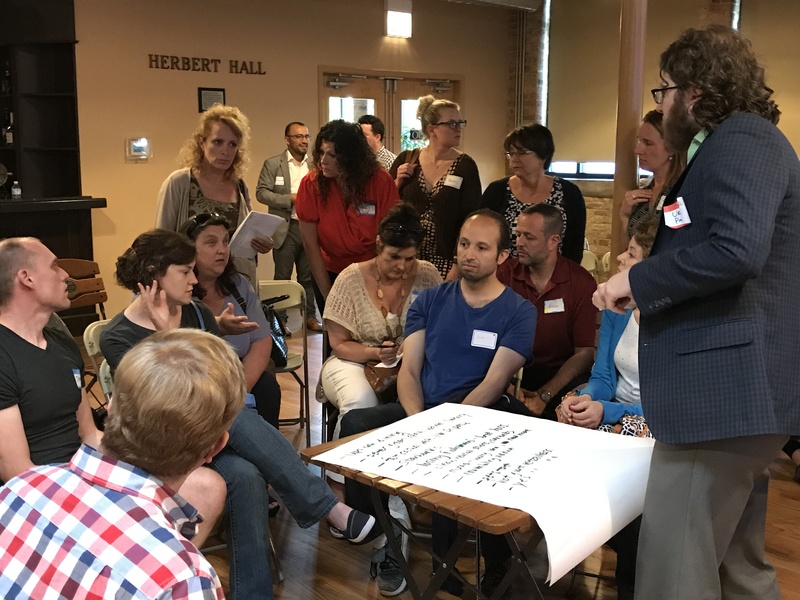 Over 150 residents and representatives from businesses and non-profit organizations participated in an evening session that explored key issues facing the area around the Jefferson Park Transit Center. Alderman John Arena kicked-off the meeting by welcoming everyone and calling for a need for a Master Plan to create and implement a vision for Jeff Park. With CTA due to renovate the transit center, the community is excited to plan and have input on what should happen nearby the station. Participants broke into three sessions to discuss three core topic areas: (1) community character and land use, (2) economic development and housing, and (3) transportation access. Ideas for attracting businesses covered a broad range, including launching a major marketing campaign, providing a neighborhood activity center for travelers staying nearby, and providing a major uplift of the look of the storefronts and streetscape. People observed that there are some great local businesses like Gale Street Inn, Rep Chi, and the newly opened Chelita’s Homemade Ice Cream. However they wish they were located closer together , making it more appealing to walk around. Ideas for transportation focused on improving the walkability of the area, providing safe pedestrian crossings, taking advantage of nearby bike paths in the Forest Preserve, reducing conflicts between cars, bikes and pedestrians, and exploring parking strategies in appropriate locations. Next steps include encouraging more participants to take the COMMUNITY SURVEY, which will be open through Friday, June 30 (500+ responses so far! ), making comments anytime through the project website (use the SHARE YOUR IDEA tool), and coming back together this fall to review initial strategies. For coverage in Nadig Newspapers, please see here. Visit the DOCUMENTS page to access the presentation slides and exhibits presented at the meeting. The local newspaper promotes the upcoming COMMUNITY MEETING #1, which is set for Monday, June 19, 2017. We invite you to attend to share your thoughts regarding a vision for the Jefferson Park Station Area. The meeting will be held from 6:00 PM to 7:30 PM at the Copernicus Center Annex (5214 W. Lawrence Avenue). Check out the full article here. Have your voice heard! We invite you to attend COMMUNITY MEETING #1 on Monday, June 19, 2017, to share your thoughts regarding a vision to improve the Jefferson Park Station Area. The meeting will be held from 6:00 PM to 7:30 PM at the Copernicus Center Annex (5214 W. Lawrence Avenue). See you there! It is critical that we hear from you –- how you get around the area, what other business districts you go to for shopping or restaurants, and what types of uses you would like to see in Jefferson Park. The short, twelve question SURVEY will take you no more than ten minutes but is very important to gather ideas and perspectives from residents, visitors, businesses, and customers for the Jeff Park Station Area. (1) How would you describe the Jefferson Park Station Area now? (2) Describe one way the area can be improved. (3) What is one thing you would like to achieve through a plan for the area? (4) Are there any business districts nearby that you believe offer good examples for Jeff Park? A copy of the full presentation is here. Stay tuned for the date and location for the first Community Meeting. We would like to hear from you. If you have an idea to share, please use this site to weigh in on what you would like to see in the plan. Feel free to take a picture of something you would like to share as an example of what you would like to see in Jeff Park and send it in through the SHARE YOUR IDEA tool (just tell us why you took the photo).